Imagine an editor where you can tweak any action ever done in the past without having to redo any subsequent steps. That's Ormr. Ormr isn’t a random arrangement of letters, contrary to what one may initially think. It actually means “European dragon” in Old Norse, and we’ve decided to make it our mascot. It’s short, it’s memorable, and, admit it... dragons are cool. So Ormr is the smart dragon that’s always there with you as you create, doing all the manual work behind the scenes for you whenever it’s needed. 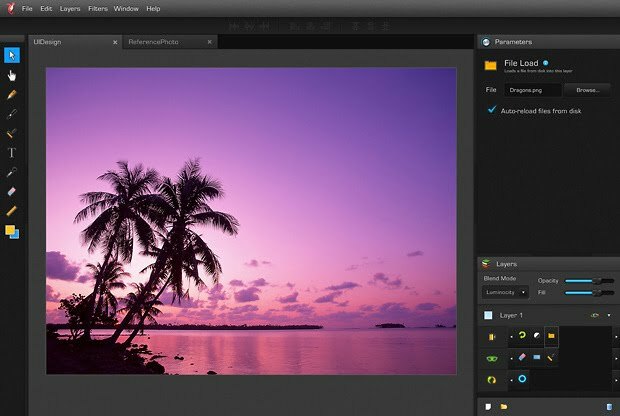 It’s the first major advance in image-editing workflow since layers were first introduced in 1994, and it can save artists countless hours of manual, creativity-destroying repetitive work and frustration. Don’t believe us? Try this: open your favorite editor, make a rounded-corner vector rectangle, add three roughly equally-spaced points to the bottom edge, and drag the middle one down. Congratulations, you’ve just made a speech balloon! Now you realize that the corners are too large/too small/the-creative-director- comes-knocking. You need to change them. Can you do it without redoing the subsequent work? Ormr can. In Ormr, you simply click on the original rectangle operation you’ve performed, and drag a slider with the corner radius to adjust it. Ormr will remember that you’ve added points afterwards and how you manipulated them, and will redo all the work for you - instantly, and with no effort on your part. And it keeps this information neatly organized by layer, too, so it’s easy to work with. Think the above is an isolated case? Have you ever kept “spare” layers in your favorite editor, just in case you needed to go back to them? Or saved multiple copies of the same file at different design stages? The truth is, this kind of thing happens all the time, be it selection (think of sharpening only a portion of the photo, such as the eyes - and then wanting to change that region after the selection has been lost), brush strokes, creating new shapes or adjusting colors - most of these are hard or impossible to change once they’ve been performed. All design is iterative, and all artists constantly go back and tweak, adjust, reposition their elements to get the look just perfectly right. And often, that’s really hard to do with the existing tools. Being, in part, artists ourselves, we want to change that. In fact, we think Ormr is a revolutionary advancement - one that has the potential to change the entire industry. By backing our project, you can be a part of this change, and make countless artists’ lives easier and more creative in the process. They represent only a very limited selection of the types actions you can do; the moment you want to perform even a single action that is not on the menu, the whole workflow breaks down, and you can’t go back past that step and adjust something without redoing more work manually. They apply to the whole image. Yes, you can add a mask to them. Manually. This becomes a huge problem if you’re dealing with more than a couple layers. And if the layer shape changes? You need to redo that mask again. They’re a hack, resulting in sub-optimal workflow. Adjustment layers were added as a half-way measure to kind of add the ability to go back and tweak things, but without actually changing the entire application to properly support this kind of idea everywhere. Since we’re starting with no legacy code or legacy design, we can re-think this and create a more streamlined, efficient, and intuitive experience. You can’t use adjustment layers on masks themselves. Ormr, meanwhile, will automatically keep all the actions you’ve done, per mask and per layer. On the surface, Ormr looks and feels mostly very similar to existing image editors - anyone familiar with them would be immediately able to use it. However, if you look closer, you’ll notice that each layer can be expanded to show several rows of blocks below it. These rows are every action you have ever done on this particular layer, arranged chronologically, and they are further organized by their intended target - one row each for layer mask actions, layer effects actions, and main layer image. 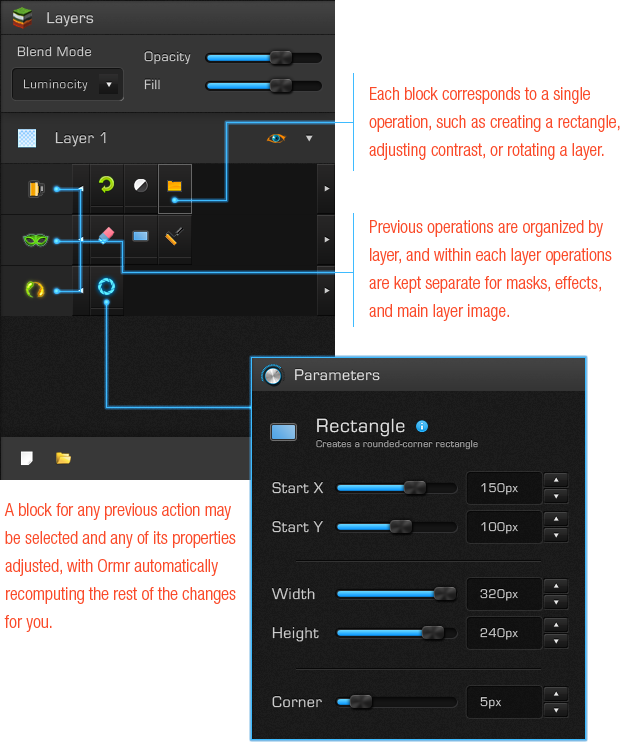 Any one block represents a single operation, such as creating a new rectangle or rotating the layer, and any one may be selected and its controls manipulated to change the effect of the action. As you adjust a block’s settings, Ormr will update the image in real time to reflect all changed currently applied to it. In addition to allowing artists to adjust any action done in the past, Ormr has a number of other advantages over all current image editors. Ormr has the fastest, most fluid UI you’ve ever used. Why? Because the core UI library it runs on is not only hardware-accelerated, but was originally optimized to run at 60 frames per second on an iPhone 3G. Putting on a modern computer makes it blazingly fast and responsive. ...And maybe iPad. Ormr is built on a set of libraries that run natively on eitherPC or Mac. In fact, once you acquire Ormr, you’ll be able to use it on whichever platform you choose at any time, or even simultaneously. We realize that Ormr will never be used in a void - that’s why we’re making it play nice with as many other applications as possible. It’ll support all key file formats right out of the box - PSD, JPG, TIFF, PNG, CR2 and CRW, NEF, and many more to allow to easily share your work with others who may not have Ormr yet. Another reason for building Ormr is bugs - but not ours. 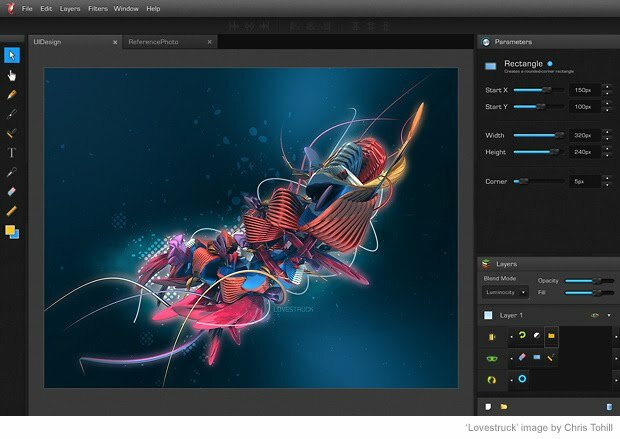 After extensively using one of the most popular image editors available, we were driven up the wall by small, but incredibly omnipresent and madly productivity-ruining bugs in it. From inconsistent and broken layer visibility undos, over-accelerated auto-scrolling on zoomed-in images while making a selection, to not copying anything at all when you hit "Copy All" instead of "Copy" on a single layer, these are everywhere, and constantly get in your way. We strongly believe the software should get out of your way as much as possible and let you focus on the things you want to do, instead of constantly being in your face. And we’ll make sure Ormr behaves like that. We want Ormr to help as many users as possible - and that’s why we’ll make sure it’s affordable. Unlike some editors that may cost hundreds of dollars for a single license, Ormr will cost somewhere between $15 and $30 - and users won’t have to pay separately for each platform they run on, so if you want to use on both Macs and PCs, you’re more than welcome to. We’ll also make it DRM-free, since we want to treat our users with as much care and respect as possible. What this means in practice is the fact that many features and behaviors in current software exist only because they have been there since the very beginning, or were added by a management committee. For example, why is there no good way to switch between all open documents in most of the popular image editors? Simply because no one had re-thought that point. We want to take all of our experience, plus your input, re-think some of these small, but fundamental behaviors, and build something that has been created with the arist first and foremost in mind - not history or management. So, given all of the above, we think we really have a unique idea that may revolutionize the design industry and make the lives of countless artists, designers, and photographers much easier and more creative. We also have the experience and the knowledge to bring it to life. All we’re missing is your support. You can help influence the development of Ormr in a couple of ways. First, of course, is by backing us for one of our awesome reward levels. And second just by spreading the word - mention it to anyone who you think might be interested, and if the artists, designers, and photographers agree that this is what they want, we’re sure Ormr will become a reality soon! We’ve previously created a number of iOS and Mac games, most notably “Ultraviolet Dawn”, “Train Titans” and “Violet Storm”, as well as worked on professional 3D content-creation applications such as Side Effects’ Houdini and Okino Computer Graphics’ Polytrans. This large and varied experience gives us a unique mix of insights and skills in almost all major areas related to computer graphics, from mobile games to feature film creation tools. Notably, we have not created our mobile games in vain: instead, we were busy building them on a common, cross-platform real-time UI library which has been in continuous refinement and testing since 2009. It is this library we are using as a foundation for Ormr. Scope: The project is fairly large in terms of all the diverse functionality that it must deliver. We're tackling this with three key approaches: 1) Relying on our own, well-tested, existing code base to speed up development; 2) Relying on third-party libraries for some of the functionality for the same reasons; 3) Relying on the build and prototyped procedural approach, which by its reusable nature reduces the amount of work that has to be performed. Stability: Despite the above, lots and lots of new code has been and still needs to be written, which inevitably leads to bugs. We're tackling this on several fronts: 1) By having automated, consistent test suites that get run every day to point to any newly created problems; 2) By planning to run a large alpha- and beta- testing programs with automatic error reporting built in, delivering the details of almost every crash or error to us (with the user's consent, of course). There also used to be a risk that our unproven workflow idea may not work in practice in terms of either performance or architecture. However, we have already validated both of these with a prototype you can see in the video, which implements enough of the very basic functionality to demonstrate that the approach works, and works fast.